It incorporates Topre's patented 30 million key life cycle non-contact electrostatic capacitance switches with a switch weight of 55g. The classic black on beige/grey keycaps with their soft tactile feel and N Key Rollover ensure fast and accurate input. It is a beautiful piece of gear, adds quite a bit of joy to everyday computer work. 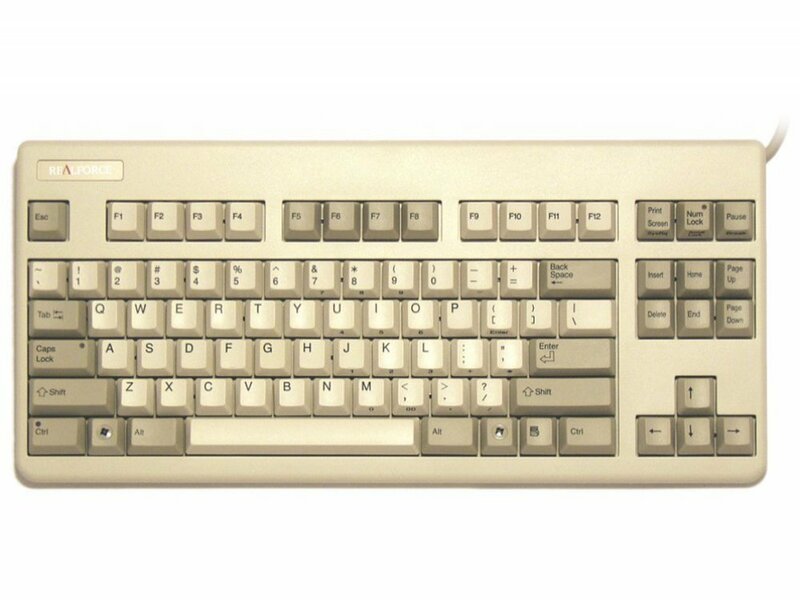 Nowadays it is hard to get any made in Japan electronics in Europe, I'm glad Topre still makes these keyboards in-house. Here's a perfectly weighted Topre board, at least for me. Its thock, great keycaps, and tactility all come together and spell out perfection in the back of my mind. This is the best stock experience I have had with a keyboard to date. 45g-weighted Topre felt alright, but was too light for me. I didn't actually expect a uniformly weighted 55g version to be as spot on as it turned out to be. As someone who is forced to type on a cheap membrane keyboard at work, I was looking for a board I would thoroughly enjoy typing on at home, and the Realforce 87U 55g does make me look forward to closing time. Mind you, some people do find 55g Topre domes too heavy to type on over prolonged periods of time, and I have even come across someone in a forum thread who argued that you will get used to the weight if you aren't already as your fingers toughen up, develop more muscle tissue. I will reach for no such arguments here. My personal suggestion would be to try 45g and 55g domes out at a keyboard meetup if you can, and I wish I would have as several of my other boards are now probably going to member of the family or friends. I am working with this keyboard for a couple of months. - Well built. The key caps are made from PBT. - I like the design a lot. Most mechanical keyboards are black, mat and have back-lighting and fancy logos. I use my keyboard for programming so the game industry design is not my thing. - Too expensive. These keyboards are imported from Japan. For those who want to try Topre there is the cheaper CM Storm Novatouch alternative. - Spacing between keys. Although I do not have large hands I would prefer somewhat larger spacing between keys. - Keys seem a little hard to type on. I have the 55g version for all keys. I would like to try the ergonomically distributed and the 45g one (less weight). 55g was bit of a gamble. Overall i think this is a good keyboard. There are some options to change keycaps if you would like to personalize it (check ebay for Topre keycaps). Try it before you buy it because it is quite expensive. This is the second Realforce 87u 55g that I own. That in itself speaks volumes as these boards are not cheap. I have a black one at home and the white at work. They are so good, lovely feel when typing and built like tanks. I can't imagine myself ever moving away from these boards now. I have had many Cherry and Topre boards and this is a standout keyboard. It is a lot of money but, I can truly say it is money well spent. As always thekeyboard.co provided impeccable service. This is a premium product. The case, the keycaps, the Topre switches, the solid build. One of the few products still made in Japan. If you're a serious typist and don't mind spending 160 quid or more, you owe it to yourself to buy this keyboard. The 55g switches might be a little heavy at first, but you'll get used to them. Topre switches are unique in the world of mech keyboards -- when you start typing on them, you're sort of underwhelmed, and wonder what the big deal is. Then, a few hours later, when you haven't used the board, you find yourself itching to get back to your desk. The switches get under your skin, and you realize their greatness later, like listening to a song that doesn't quite resonate with you, but ends up on a loop in your head. I will definitely buy other keyboards (I'm looking at Matias and Unicomp to round out my collection), but the Realforce sits at the very top of the heap.